“Street photography is back” was the title of an email that I received today. Funny, I never knew that it went away. Having said that, the current exhibition taking place at The Museum of London has given the genre a bit of a boost. There are so many great exponents of street photography working in London today that even I have to admit that it isn’t so much back as resurgent. This got me thinking about some of my own work from early on in my career. I remember sitting in my office one day and a very old friend rang me and asked if I have any pictures of street markets that his younger sister could borrow for a school project. I had a few but, in the absence of anything better to do, I went off to Leather Lane market and shot a couple of rolls of film. At that time I was part of a small agency and we had a rapidly growing library of images that was starting to make us some money. Stock photography was a good marketplace back in the late 1980s and early 1990s and I thought that it wouldn’t hurt to add a few market pictures. This was my favourite frame of the lot. Shot on a Nikon FM2 with a 35mm f2 Nikkor lens and Kodak Tri-X film – a copy of this print made on old-fashioned bromide paper still hangs on my own office wall. The reasons that I like it are many and varied but the fact that it was born of a simple request from a very good friend (in fact, two years later he was my Best Man at my wedding) gives it extra weight for me. The fact that it has made me quite a bit of money as a stock image certainly doesn’t detract from its appeal but the other thing that makes me love this picture is that it reminds me just how simple photography can be. A mechanical camera with a fixed focal length lens, no automation whatsoever and time. Street photography is all about opportunity and patience. Waiting for the moment to happen is part of the way that I shoot anyway but I also spend a lot of time looking around trying to anticipate good compositions, watching for the way that light hits surfaces and people. I have a very clear recollection of how this picture was made. 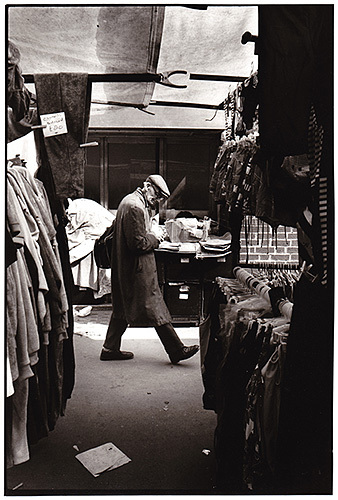 I had seen the man walk up through the market and grabbed a couple of frames of him as he walked and shopped. Then I saw this nice gap between stalls and concentrated on framing it and I have the same composition with at least five different people passing through. Finally the interesting person that I really wanted came back and I clicked one frame of him (no motor drives on my FM2s that day). The little black border around the print is the rebate of the film which means, for those of you who are too young to have shot much in the pre-digital era, that this is the whole frame as it was shot – no post production cropping. 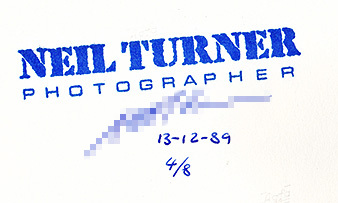 When I scanned the print this morning I noticed that this was one of a short edition of hand-prints that I made of this frame and you can see the stamp and date that were on the back with my pixelated signature. Simple and happy days but I don’t particularly want them back. Opening a box of prints brought back the smell of the darkroom and the associated cough rather too vividly. I haven’t made a black and white print in a traditional darkroom since January 1994 and I don’t miss it one bit!